Rain poured as emergency personnel worked. 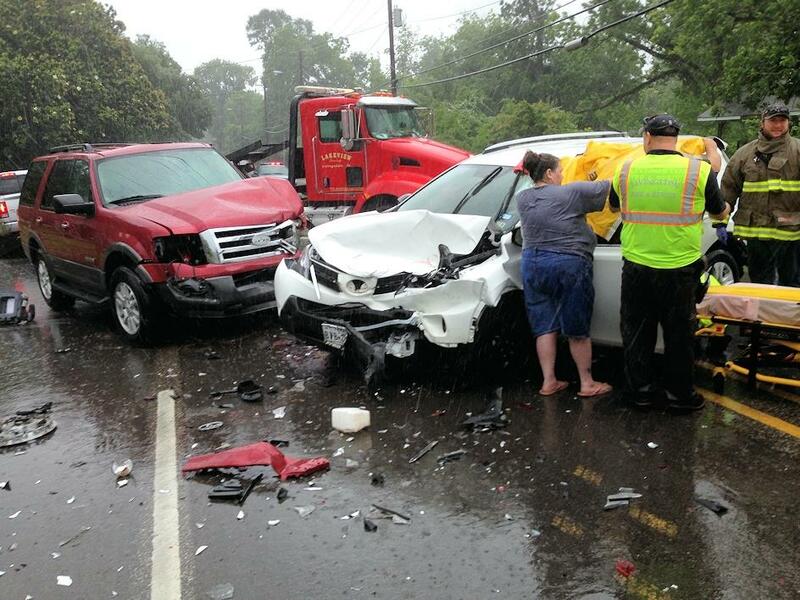 Driver Rear Ends Vehicle Causing 3 Vehicle Accident, LIVINGSTON, June 9, 2014 - At approximately 12:45 pm on June 9, 2014, a white 2013 Toyota Rav4 driven by Cheryl Bishop, 58, of Livingston, was south-bound on South Houston (US-146). Bishop was waiting to make a left turn onto Abbey Street when she was slammed from behind by a silver 2014 Dodge Ram driven by Justin Jordan, 25, of Livingston. The impact pushed Bishop's vehicle into the north-bound lanes of traffic causing Bishop to be slammed again by a north-bound 2007 Ford Expedition driven by Emily Bailey, 26, of Tyler. Bailey's and Bishop's vehicles came to rest in the middle of South Houston. Jordan's vehicle pulled around Bishops and rolled into the north-bound lanes where it came to rest. Americare Ambulance Service was dispatched to the scene along with the Livingston Volunteer Fire Department Heavy Rescue Unit and Officers Kevin Ward, Kevin Blackburn, and Sergeant Ronnie Bogany (all with Livingston PD). Justin Jordan and Emily Bailey escaped injury, however Cheryl Bishop sustained injuries and was transported by ambulance to Livingston Memorial Hospital. Both the north-bound and the south-bound lanes were blocked during investigation and cleanup. Justin Jordan was cited for failure to control speed. A rollback wrecker from LakeView Towing recovered Jordan's vehicle and it will be stored in Livingston. Bishop's vehicle and Bailey's vehicle were recovered by Ken's Towing and will be stored at Harrison Body Shop in Livingston. This 2014 Dodge Ram, driven by 25 year old Justin Jordan of Livingston, slammed Cheryl Bishop's 2013 Toyota Rav4 from behind. Bishop's Toyota was slammed dead center. The impact pushed Bishop's vehicle into the north-bound lane causing Bishop to be slammed again on the front end. Emergency personnel worked in a downpour as they carefully removed Bishop from her vehicle. Bishop sustained serious injuries and was transported to Livingston Memorial Hospital by ambulance. Bishop's and Bailey's vehicles were recovered by Ken's Towing.